Keep your mind sharp! 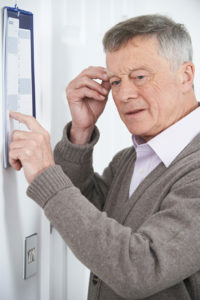 Discover how to recognize dementia symptoms and slow memory loss. Claim your FREE copy, right now of our definitive guide on memory loss, dementia, and Alzheimer's disease. You misplaced your keys again. Should you be concerned? Walking in the supermarket, you notice a friend at the far end of the aisle but quickly dart around the corner because you can’t recall her name. Is this a reason to be worried? You open the refrigerator but can’t remember what you’re looking for. Cause for alarm? Are these “senior moments” or symptoms of something more serious? Are they signs of dementia? How can you tell? And, more importantly, is there anything you can do about it? Introducing a free report from University Health News, Dementia Symptoms, Stages, and Treatment: Vascular dementia, Lewy body dementia, Alzheimer’s disease, and how to improve memory. This free guide will help you answer questions about your mind and your memory. How your mind works, what causes memory loss, things you can do to not only slow memory loss but reverse it and daily activities you can do to stay sharp at any age. Dementia symptoms come in many forms. Even for individuals who are showing signs of memory difficulties, dementia is not a foregone conclusion. By taking proactive steps, you can lower your risk for dementia or slow the progress of mental decline. In Dementia Symptoms, Stages, and Treatment: Vascular dementia, Lewy body dementia, Alzheimer’s disease, and how to improve memory you’ll receive detailed advice on ways to lower your dementia risk. Advice including the diets that can lower your Alzheimer’s risk up to 53 percent. Answers to questions like: Are carbs really bad for you? (Not the ones that can improve memory function.) Ways to increase the flow of oxygen-rich blood to brain is easier than you think. While a good night’s sleep is essential to better health, be careful about the medications you use to help your sleep. Some can impair your memory. Like many other health conditions, poor heart and cardiovascular health can cause serious memory loss and reduced brain function. Damage from major strokes and TIAs (transient ischemic attacks) affecting regions of the brain involving learning and memory can lead to vascular dementia. Atrial fibrillation (Afib) or an abnormal heart rhythm can cause blood to pool and dramatically increase the risk for a stroke. Knowing and quickly recognizing the signs of stroke not only reduce the potential effects on your memory, but can save your life. Lewy body dementia or dementia with Lewy bodies (DLB) represents about one-quarter of all dementia cases. Doctors believe there’s a link between Lewy body dementia and Parkinson’s disease. People with LBD often develop Parkinson’s-like symptoms – including rigid muscles and a shuffling walk – along with other typical dementia symptoms, such as confusion, trouble thinking and reasoning, hallucinations, and delusions. There is as yet no known cure for DLB, but certain treatments are prescribed to help ease lewy body dementia symptoms such as the drug memantine. Cognitive symptoms may respond to AD medications such as rivastigmine (Exelon), tacrine (Cognex), and donepezil (Aricept). To read about other strategies that may help promote better health in DLB patients, and ease some of the symptoms, download Dementia Symptoms, Stages, and Treatment: Vascular dementia, Lewy body dementia, Alzheimer’s disease, and how to improve memory. What about other forms of irreversible dementias? How can you recognize the signs of primary dementia? Symptoms vary and can be difficult to detect. What can you do to prevent them? People who have Alzheimer’s typically go through a series of stages characterized by gradually worsening symptoms, although not everyone will go through all of the stages nor progress through them at the same time. Although medications may help slow the progress of Alzheimer’s disease, it is still incurable – and irreversible. So reducing your disease risk is extremely important. In your free guide, Dementia Symptoms, Stages, and Treatment: Vascular dementia, Lewy body dementia, Alzheimer’s disease, and how to improve memory you’ll learn the lifestyle factors that can increase your odds of developing the disease. Hypertension, cardiovascular disease, insulin resistance, diet, stress, mental inactivity and a host of other factors play vital roles in the disease’s onset. The National Institutes of Health recently released a landmark plan designed to transform the approach to research in hopes of finding a cure. Scientists are incorporating recent advances in molecular biology, bioengineering, genetics, and other fields aimed at modifying the outcome of Alzheimer’s disease and finding new possibilities for the treatment of memory disorders and dementia. active and passive immunotherapies, targeting beta-amyloid proteins. Gene therapy aimed at protein production. Histone Deacetylase (HDAC) inhibitors in hopes of shutting off an enzyme which suppresses memory formation. And insulin’s production and function. Learn more about the exciting work in today’s labs and on the horizon for tomorrow, by reading this guide from University Health News. Your copy of Dementia Symptoms, Stages, and Treatment: Vascular dementia, Lewy body dementia, Alzheimer’s disease, and how to improve memory is ready to be downloaded now! While the onset of Alzheimer’s and other forms of dementia is frightening, you can take steps to preserve and improve your memory as you age and ease this fear. Your free guide outlines simple habits you can follow to improve your recall and retention. You can also engage in brain training exercises to protect against memory loss. These activities are simple and fun ways to improve your memory. The most enjoyable way to guard against mental decline is stay socially active. Get out with friends as often as you can. Email, text and Skype with your grandkids. Join local activities and clubs for regular outings. Having close relationships and remaining socially active requires paying attention to your surroundings, following a conversation, responding to the actions of others, and watching for verbal and non-verbal cues – all of which require a lot of brainpower. Dementia Symptoms, Stages, and Treatment: Vascular dementia, Lewy body dementia, Alzheimer’s disease, and how to improve memory is your guide understanding your mind and learning what you can do to preserve its function. P.S. Ever considered meditation? It’s more than just a way to relax. Research suggests that the ability to pay attention – a key aspect of memory – declines with age. One excellent way to improve your ability to pay attention and remember is to practice mindfulness meditation. Older adults who meditate have better preserved cortical regions of the brain – regions responsible for attention, sensory processing, and integrating emotional and cognitive processes that normally thin with age. P.P.S. Remember, while you can’t put a price on good health, this fact-filled, indispensable guide is absolutely FREE! This has been so helpful. I have been studying the pathologies and methodologies of Dementia and relating various aspects to structuring the way CareGivers ( my wife Beverley is the Registered Manager for Home Instead Senior Care Abergele, N. Wales) perceive and provide care not only to dementia sufferers and their families but also as eyes and ears to early recognition. Part of routine self assessment. My mother and my mother’s mother, my maternal grandmother, BOTH had Alzheimer’s. My husband is 71. He received TBI 1/3/2011.